Steve Conley bagged this massive northern-strain bass on a trip to Cape Cod in May 2012. That lunker was at least 6 1/2 to 7 1/2 pounds and was released immediately. 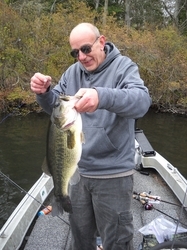 The big bass was taken on a black jig with a black RotoTail trailer off a brushy shoreline. Nice job Steve!